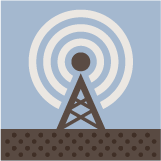 Embed your station's radio player in your website. These are based on a customised version of jPlayer that uses HTML5 Audio on browsers that support it (e.g. Webkit-based browsers like Chrome & Safari) and falls back to a Flash-based player (still using the same an HTML/CSS user interface) on browsers that don't (e.g. Firefox, Internet Explorer). Added benefit: since most modern mobile web browsers are based on Webkit, this player will work fine on most modern smartphones. The player will detect a loss of connection and attempt reconnection to the stream. The CSS. A starter stylesheet file is provided here as an example. Feel free to link to it directly, or download it and tweak it to arrive at a design that matches your website's look & feel. These widgets use the Font Awesome web font (for the play/pause/mute icons) which is linked directly from Radiojar in the starter CSS. Check out the live demos below and click to get instructions for using the code on your website. To play the media you will need to either update your browser to a recent version or update your <a href="//get.adobe.com/flashplayer/" target="_blank">Flash plugin</a>. Include the following code just before the closing body tag. Instead of "uf6x8w5f81ac", use your station's stream name. You can find your station's stream name (streamName) in the management area of your station, select Tools and then Widgets (check out the screenshot to the right for the exact location). Set autoplay to false if you don't want the player to start playing automatically when the page has loaded. Display artist/track name & album art, hover on the mute button to adjust volume. Please note that to accurately show track information, you will need to upload appropriately tagged MP3 files to Radiojar's media library. You can edit all the relevant meta-data directly from the Media Library. Include the following code just before the closing body tag. Instead of "uf6x8w5f81ac", use your station's stream name. You can find your station's stream name (streamName) in the management area of your station, select Tools and then Widgets (check out the screenshot to the right for the exact location). Set autoplay to false if you don't want the player to start playing automatically when the page has loaded. The enableUpdates option enables track information display. The image URL supplied in defaultImage will be displayed whenever there's no album art available.